Originally cars had many belts. Those belts wore out at different rates and if one broke while you were driving, it could cause catastrophic damage to the rest of the engine. Modern cars have a timing or serpentine belt that connects to various parts of your engine including the alternator, power steering pump, air conditioner and sometimes water pump. Some cars still have a few parts that run on separate belts but, for the most part, cars today have just the one belt. How Do You Know it’s Time for a New Belt? Because they’re made out of rubber, they don’t last forever. It’s easy for your mechanic can check to see if yours needs replacing. It’s good practice to check or have yours checked starting at about 50,000 miles. Some last as long as 150,000 miles but this is one preventative maintenance items that you’re better off doing sooner rather than after it breaks and you’re left stranded. One sign yours has failed is if your power steering and air conditioner go out at the same time. If you hear squealing from your engine you should have yours checked, that can be a warning sign yours is ready to break. You don’t want to be caught with a broken serpentine belt or have it break while you’re driving. What Does a Worn Belt Look Like? As the rubber begins to age, it may become shiny in appearance. Another sign is fraying or cracks in the rubber. Most cars have a belt tensioner that keeps the belt stretched properly so although the belt was one size when originally installed with temperature changes, its tension changes and it’s stretched and released much like a rubber band. Eventually the changes in size and temperature cause the belt to fail. Can I Replace it Myself? This is one of those jobs best left to a mechanic unless you have a great deal of automotive knowledge. The belt must be installed around the various motors properly and at the right tension. If your car has a tensioner pulley, you’ll need to know how to set the tension, if not, you’ll need the tool to set it. The belt itself, on average, costs about $70 and installation takes a mechanic less than an hour on most cars. If you’re looking for a mechanic to check and replace your timing belt, call Oldsmar Automotive at (727) 784-3501 and we can schedule your appointment. If you think yours is ready to go and want to stop by our shop, we’re conveniently located at 3166 Tampa Road in Oldsmar. 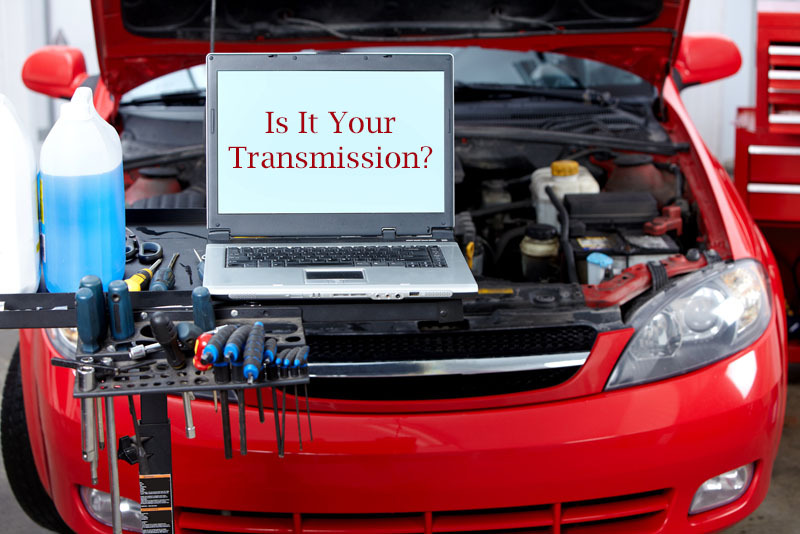 Your transmission can give you many signs that it’s having issues. Of course, if your check engine light is on, you should see your local mechanic so they can diagnose and fix the problem, whether it’s transmission related or not. Transmission troubles show up in many ways, with just one being an illuminated check engine light. Here are other signs you might need a visit to your local mechanic. Unlike the water you see under you car after running your air conditioner, you should never see transmission fluid. Usually reddish in color with a sweet smell, a leak will show itself under the middle of your engine. Transmission leaks come from worn gaskets, seals, a rusted out pan or other reasons. Don’t wait, if your car loses all its transmission fluid, your engine can seize up. It doesn’t matter if you have a standard or automatic shift vehicle, if you hear grinding noises or clunks during a shift, have your transmission checked. Grinding, slipping into neutral especially with a standards shift car, or jumping during acceleration are other common shifting issues. If you start your car or have it in neutral and hear grinding or clapping, call your local mechanic to schedule an engine check. This may be an early sign of a transmission problem or it may just signal that the fluid is low which could be the result of a leak. Normally we don’t smell our car. If you begin to notice a burning smell, it might be your transmission fluid. This might not be an actual transmission problem but it may be a sign that your transmission fluid needs to be flushed and replaced. If you don’t attend to this sign as soon as you notice it, you will end up needing repair or even a new transmission. If you don’t have a local mechanic you know and trust, come to Oldsmar Automotive. Our team of transmission experts will check yours and provide an honest and fair repair estimate. Don’t let your transmission troubles turn into a seized up engine, have it checked today. You can call (727) 784-3501 to schedule an appointment or come by our facility at 3166 Tampa Road in Oldsmar. In part two of our mini-blog series, we’re going to look at maintenance for your car’s exterior and inside your vehicle. Your car’s exterior has many working parts you may not always think about. Keeping the inside well maintained won’t prevent a break-down, it can help you when it comes time to sell your car. 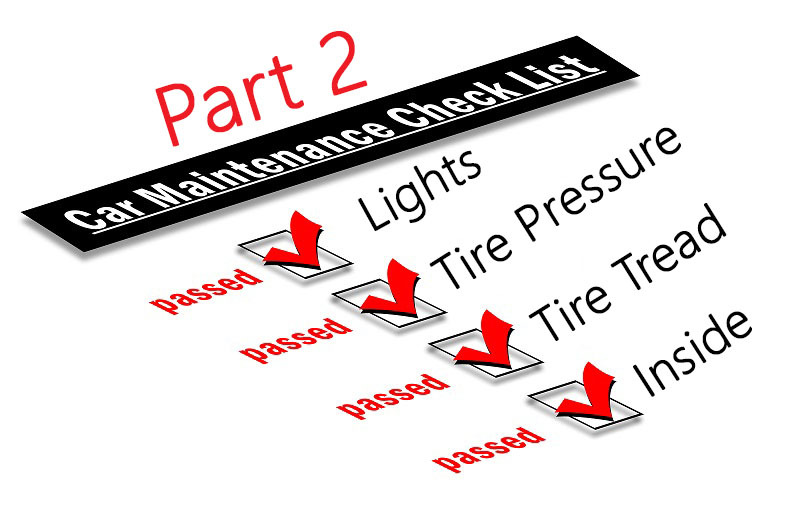 How often to you check the working elements of your car’s exterior? Did you know you can be ticketed for a brake light that doesn’t work? Have a friend help you check all the lighting on your car this includes turn signals, brakes, headlights, and parking lights. Next look at your tire tread. Is it time for new tires? One way to know is take a Lincoln penny and put it head side down into the tread. If you can see all of Lincoln’s head, you need new tires. While you’re looking at your tires, check the tire pressure. Your car’s tire pressure can be found inside your driver’s door panel. Proper tire pressure gives you better gas mileage and helps them last longer. Does your car have a gas cap? If so, give it a jiggle and try turning it backward. Does it feel secure or is it cracked? Did you know that when your gas cap doesn’t seal you risk allowing water into your engine? Replacing yours is simple and doesn’t cost much but could save you thousands in repair bills. We hinted in part one of our blog that your car’s interior might have an air filter. It’s called a cabin air filter and helps keep the air inside your car fresh. It should be checked and replaced as necessary. Look in your owner’s manual for the location and pull yours out and inspect it. When was the last time you vacuumed your car’s interior? Part of your regular maintenance should be vacuuming the floors and cloth seats. When you don’t, small rocks, sand and other debris can speed up the deterioration of your car’s interior. Plus when you remove decaying leaves and other things your car will smell better. If you have leather interior, use a leather cleaner at least four times a year. The heat and sun in Florida quickly dry out leather seats and using a leather cleaner and conditioner can help them stay in good condition. We offer all maintenance services as well as repair services to all types of vehicles. If you need new tires or some of the lights on your car replaced, we can handle it for you. Although we don’t vacuum cars or clean your leather, we can replace the interior air filter. Call us today to learn about the many services we offer and schedule your appointment – (727) 784-3501. By now you’ve likely made (and broken) a few resolutions, but it’s not too late to add another one to your list – regular maintenance for your car. Proper and regular maintenance helps your car last longer, be more fuel efficient and prevents big repair bills. Your car’s manual will tell you how often you need an oil change, to flush the fluids and when spark plugs and belts should be replaced. In this month’s blogs we’re going to do a two-part series about car maintenance so you can plan for the costs you may have in the coming year. Check all fluid levels and color – Your oil is the one you’ll need to change or top off most frequently and one most people check from time to time. However, don’t forget about the other engine fluids, they’re just as necessary and should be checked and changed. This includes your power steering, brake and transmission fluids. Inspect your belts – The belts in your engine wear out. When they become dry and cracked they break leaving you stranded. Look at yours and make sure they still appear in good condition. Air filters – Your car has one or more filters. They’re easy to check and replace on your own. If they’re not clean looking, you probably need a new one. Check your owner’s manual for locations (hint there might be one in your car’s interior compartment too). If you’ve found any items that need attention, call the professionals at Oldsmar Automotive. 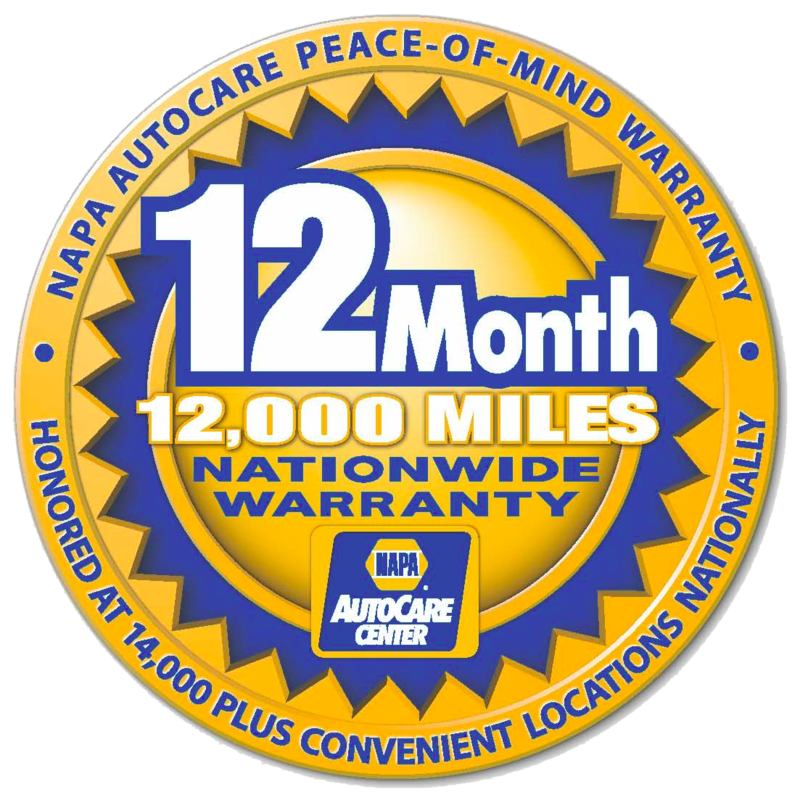 We can schedule an appointment or provide you with an inspection of your vehicle and give you an estimate for repairs. If it’s regular maintenance like a fluid flush, just tell us the make and model of your car when you call and we’ll give you a price over the phone. Call (727) 784-3501 or stop by our facility at 3166 Tampa Road in Oldsmar. This isn’t a fun game and sadly the reward for getting the correct answer is often an auto repair bill. However, being able to identify a fluid leaking from your car can let you know if you have a big problem or no problem at all. 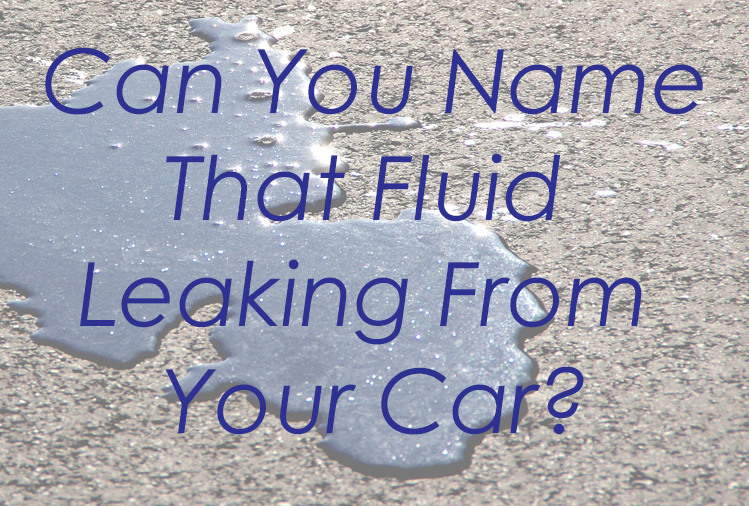 Here are some tips to helping you identify the fluid leaking from your car. Most of the time clear liquid is nothing more than condensation from your air conditioning. In Tampa, we run our AC most of the year so we’re more use to seeing clear puddles beneath the car. Of course, if there’s an odor to the liquid, there may be a problem. Although some wiper fluid is green, most is blue. If you just filled yours and there’s just a small amount, you either missed or overfilled it. 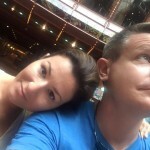 If there is a lot, you may have a crack in your vessel. Although this won’t affect the operation of your vehicle, it’s still a good idea to get it repaired. There are two possibilities for yellow or brown fluid. Both likely mean you need to head in for some auto repair. Yellow is most often an issue with your brakes. It’s not safe to drive your car if your brake fluid is gone. Although brake fluid starts off yellow, it turns brown when it needs to be replaced. So brown fluid may be brake fluid. Brown fluid may also be oil. If you just had your oil changed and it’s just a little bit, go back to the oil change location and have them check that they tightened the filter and put everything back properly. If there is a lot, go to an auto repair center and have it looked at, the reasons for an oil leak are numerous. You should be concerned if you see a pink or pinkish fluid leaking. You may have an issue with your power steering or transmission. If either of these is left unaddressed, you will end up with a major repair bill or even replacing your transmission. Don’t risk big repairs when you notice leaking fluid from your car. Let your trusted auto repair center Oldsmar Automotive provide you with a diagnosis and estimate for repair. We’re located at 3166 Tampa Rd in Oldsmar. You can stop buy or call for an appointment – 727-784-3501.